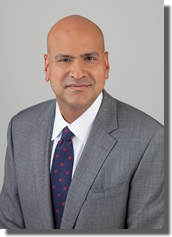 Dr. A. Bobby Chhabra graduated from the Johns Hopkins University with undergraduate degree in Biology before completing his medical education at the University of Virginia School of Medicine. He completed his Orthopaedic Surgery residency at the University of Virginia Health System. He received his fellowship training in hand and upper extremity, microvascular and congenital hand surgery at the Hand Center of San Antonio and Texas Scottish Rite Hospital. He returned to the University of Virginia in 2002 during which time he helped create the University of Virginia Hand Center. Dr. Chhabra is currently the Lillian T. Pratt Distinguished Professor and Chair of Orthopaedic Surgery, the David A. Harrison Distinguished Educator, and a Professor of Plastic Surgery at the University of Virginia. He is the Division Head of Hand and Upper Extremity Surgery. He is also the hand and upper extremity consultant for the University of Virginia Department of Athletics. His areas of expertise include hand, wrist, and elbow trauma and arthritis with a particular interest in athletic injuries and congenital hand surgery. He has a basic science laboratory that is currently investigating stem cell technology and tissue engineering principles for volumetric muscle loss and he is actively involved in clinical trials research. Dr. Chhabra is a nationally recognized Orthopaedic educator and has been a course director for several Orthopaedic board review courses. He has received the University of Virginia Master Educator Award, the University of Virginia School of Medicine Award for Excellence in Teaching and the highest honor bestowed by the UVA School of Medicine, the David A. Harrison Teaching Award. Dr. Chhabra is a fellow of the American Academy of Orthopaedic Surgeons, a member of the American Society for Surgery of the Hand and a fellow of the American Orthopaedic Association. He is past President of the Virginia Orthopaedic Society. In 2014, Dr. Chhabra was inducted into the Raven Society for his contributions to the University of Virginia. Dr. Chhabra’s main area of research is focused on volumetric muscle loss in the hand. He has an active laboratory investigating the effect of growth factors and tissue engineering principles and how these tools can be used to accelerate muscle healing to allow for improved clinical outcomes.